As we wind down the second year of our Franciacorta Real Story campaign, I’ll be posting some of the highlights from two years of tastings, media coverage, and dispatches from the appellation. What a wonderful experience this has been. Heartfelt thanks to the Franciacorta Consortium for believing in it and thanks from the bottom of my heart to everyone who supported us by coming out to taste with us, writing about us, and sharing our story. As much as I would like to, I can’t reproduce the entire article here (because of copyright issues). But here’s the link to the complete article (highly recommended but behind a paywall). I can however post what I wrote for her when she contacted me about giving her a quote for the piece. Alpine as opposed to continental climate, riper fruit at harvest, lower dosage, and lower residual sugar make for wines that are brilliantly fresh and more vinous in character, with more delicate fizziness and more creaminess (thanks to fewer atmospheres). Where yeasty and toasty notes can often dominate transalpine wines, vibrant fruit and rich minerality (some would even call it “salinity”) define Franciacorta. 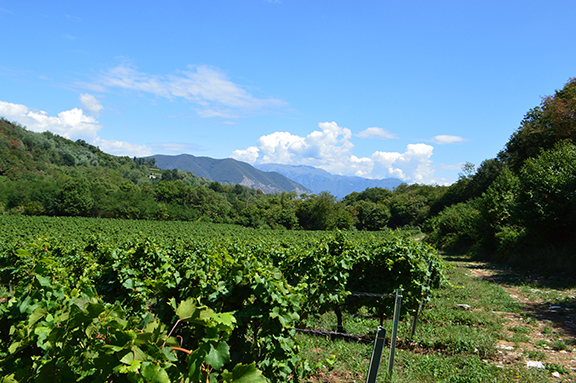 Growers have a broad spectrum of subsoils in Franciacorta, ranging from deep and shallow morainic to limestone and clay (68 distinct soil types have been identified there). This gives them great breadth in crafting their blends. As result, site generally trumps style there. Previous post ← Happy Thanksgiving from Franciacorta (Real Story)!